Synthetic peptide conjugated to KLH derived from within residues 300 to the C-terminus of Human MAFA. 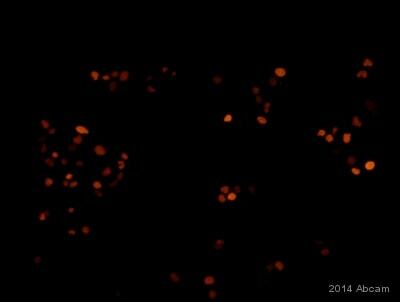 This antibody gave a positive signal in human brain tissue lysate. Our Abpromise guarantee covers the use of ab26405 in the following tested applications. WB Use a concentration of 1 µg/ml. Detects a band of approximately 36 kDa (predicted molecular weight: 37 kDa). Human MAFA has a predicted molecular weight of 37 kDa (Swiss-Prot data), however publications have shown the human protein to be detected at 47 kDa according to reference PMID 12011435, http://www.pnas.org/cgi/content/full/99/10/6737. Our data shows ab26405 to detect a band at 36 kDa in human brain, kidney and liver which is similar to that seen in other publications (PMID:14680841, PMID:18159220 (expression profile) ). The mouse protein has also been observed at 47 kDa according to reference PMID 12368292. IHC-P Use a concentration of 0.8 - 4 µg/ml. Acts as a transcriptional factor. Specifically binds the insulin enhancer element RIPE3b and activates insulin gene expression. Cooperates synergistically with NEUROD1 and PDX1. Phosphorylation by GSK3 increases its transcriptional activity and is required for its oncogenic activity. Involved either as an oncogene or as a tumor suppressor, depending on the cell context. Belongs to the bZIP family. Maf subfamily. Ubiquitinated, leading to its degradation by the proteasome. Ser-14 and Ser-65 appear to be the major phosphorylation sites. Phosphorylated by MAPK13 on serine and threonine residues (Probable). Phosphorylation by GSK3 requires prior phosphorylation of Ser-65 by another kinase. Phosphorylation proceeds then from Ser-61 to Thr-57, Thr-53 and Ser-49. GSK3-mediated phosphorylation increases its transcriptional activity through the recruitment of the coactivator PCAF, is required for its transforming activity and leads to its degradation through an ubiquitin/proteasome-dependent pathway. Nucleus. 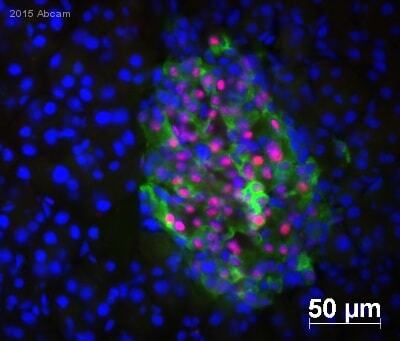 Detected in nuclei of pancreas islet beta cells. 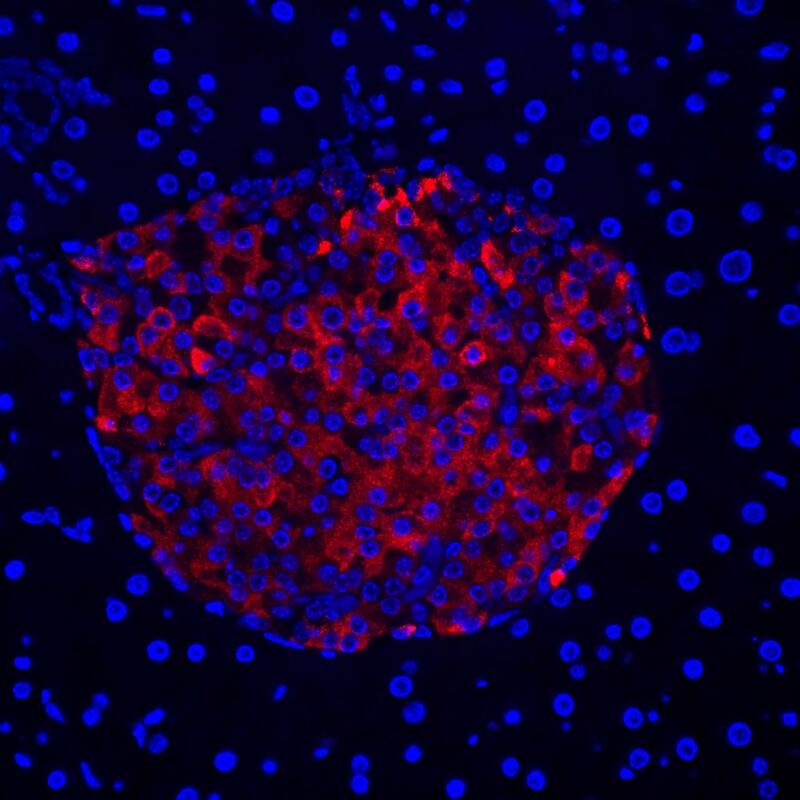 The image shows human pancreas tissue in which some cells exhibit nuclear staining. The antigen retrieval method used was Tris EDTA pH9. 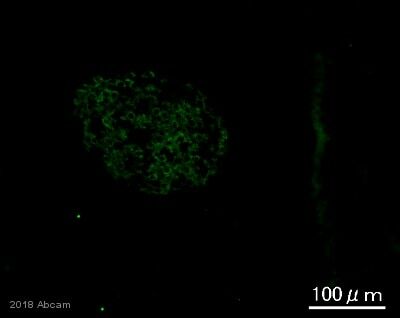 ab26405 staining MAFA in Human PANC-1 cell line transfected with synthetic mRNA by ICC/IF (Immunocytochemistry/immunofluorescence). Cells were fixed with formaldehyde, permeabilized with 0.05% Triton X-100 and blocked with 5% serum for 30 minutes at 20°C. Samples were incubated with primary antibody (1/200) for 30 minutes at 37°C. 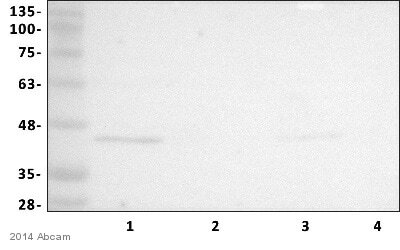 An Alexa Fluor® 555-conjugated donkey anti-rabbit IgG polyclonal (1/400) was used as the secondary antibody. Human MAFA has a predicted molecular weight of 37 kDa (Swiss-Prot data). Some publications suggest that the human protein should be detected at 47 kDa (PMID 12011435). Our data shows that ab26405 detects a band at 36 kDa in human brain, which is similar to that seen in other publications [PMID:14680841, PMID:18159220 (expression profile)]. Abcam welcomes customer feedback and would appreciate any comments regarding this product and the data presented above. Publishing research using ab26405? Please let us know so that we can cite the reference in this datasheet. 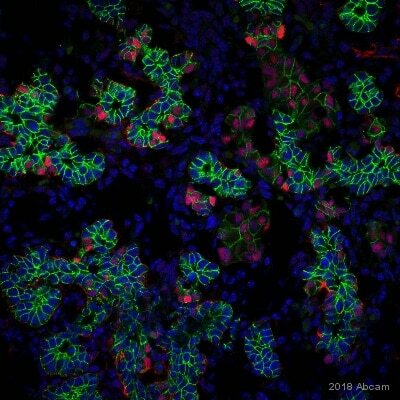 Dear technical support member, I am using your anti-MAFA antibody (ab26405) and have a question related to the unmasking procedure I should use. According to the data sheet you suggest to use Tris-EDTA buffer (pH9), but there is no information about the steps to follow in your website; would you please send me a detailed protocol. Thank you for contacting us. The IHC image on the datasheet for ab26405 was provided by a collaborator and we unfortunately do not have their exact protocol. However, it is safe to assume that the protocol is standard and that the unmasking procedure was similar to the procedure described in the PDF file I have attached, in section D: Antigen Retrieval. This general protocol can also be found on our website at this link: https://www.abcam.com/ps/pdf/protocols/ihc_p.pdf Section D contains a recipe for Tris-EDTA pH 9.0 and recommendations for heating. Briefly, if using a microwave or steamer or water bath, you will want to maintain the slides in the buffer at 95-100C for 10 - 20 minutes, followed by cooling for another 20 minutes. The optimal amount of time for your tissue sections will need to be determined but in general, 20 minutes at 95-100C is usually sufficient. I hope this information is helpful to you. Please do not hesitate to contact us if you need any more advice or information.